Gear up with AT3 Tactical Pro Series Handguards, with 5 different lengths to suit your next build. Free float design enhances accuracy by keeping stress off the barrel. 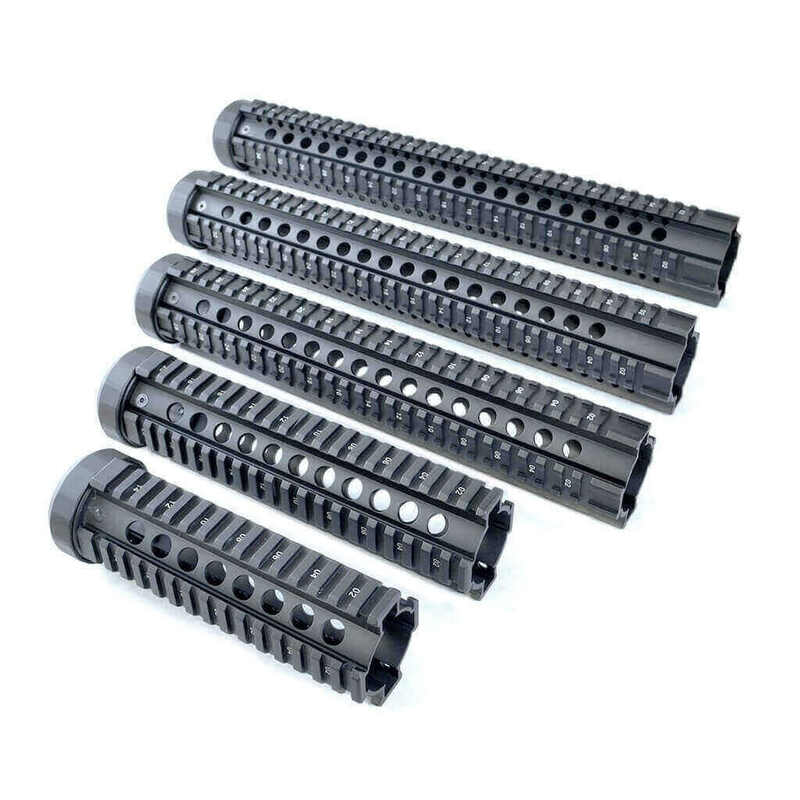 Rock-solid 6061 Aircraft Aluminum handguard that withstands the toughest conditions. Unique low-profile design — taller than it is wide (see pictures for exact dimensions). This makes our rail extremely light and easy to grip. Backed by the Lifetime AT3 Warranty. Hardcoat anodization provides a durable surface that resists scratches and matches your existing parts. For our those with Magpul Flat Dark Earth Cerakote, the finish is even more durable. The Pro-Series Quad Rails are some of AT3 Tactical’s most popular products — 5-star reviewed, top-tier AR-15 quad rails at great prices. Full kit includes all mounting hardware as pictured below. Installation is simple, just replace your current barrel nut with the nut we provide. One-piece construction — rock-solid fit! Please Note: These quad rails are made for standard AR-15’s. If you have a 7.62/.308 AR variant, check out our AR-10 / 7.62 / .308 page. A: No – these quad rails are made for standard AR-15’s. If you have a 7.62/.308 AR variant, check out our AR-10 / 7.62 / .308 page. I put this on my Saint in replacement of the BCM polymer handguard. After installation, it was solid. Barrel-nut included keeps it tight to the upper. This is a great product and could be valued higher. I was very surprised how solid of a rail this is. Lightweight and great design !!!! Amazing customer service and crazy fast shipping. I will definitely be ordering more. It is a great rail not to big and not a skinny one just right... I have two of them one build done the other to be complete soon. Ordering another soon! I am loving this quad rail. This is the third one I've bought for my AR, but neither of the other two would accept the angled foregrip I bought for it. I was starting to think it was the grip that was the problem, but after trying some other accessories that weren't fitting right, I realized it was the rail. I searched for quad rails on Google and found the AT3 website. After finding out they're US based and seeing the great reviews, I decided to try them out, especially with the reasonable prices being charged. As you can see in the photos, everything fits great on this rail and I am more than happy with the purchase. It seems like a solid quality and was easy to install. The rail was shipped and arrived quite quickly also. I will be recommending AT3 to all my friends. Thanks for sharing your feedback, Adam. We're glad you're satisfied with your purchase. Cheers!